This example problem demonstrates how to find the energy change that corresponds to a change between energy levels of a Bohr atom. 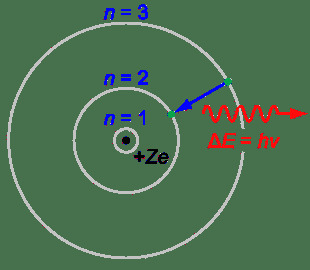 According to the Bohr model, an atom consists of a small positive charged nucleus that is orbited by negatively charged electrons. The energy of an electron's orbit is determined by the size of the orbit, with the lowest energy found in the smallest, innermost orbit. When an electron moves from one orbit to another, energy is absorbed or released. The Rydberg formula is used to find the atom energy change. Most Bohr atom problems deal with hydrogen because it is the simplest atom and the easiest to use for calculations. What is the energy change when an electron drops from the n=3 energy state to the 푛=1 energy state in a hydrogen atom? The energy change when an electron in the n=3 energy state to the n=1 energy state of a hydrogen atom is -1.938 x 10-18 J. What Is the Principal Quantum Number?